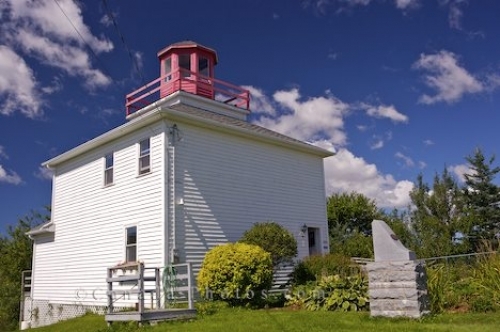 The small community of Burntcoat Head in Nova Scotia, Canada worked together as team as they felt a reconstruction of the lighthouse was necessary and by the end of 1994, their hard work paid off. In 1972, the Burntcoat Head Lighthouse in the Bay of Fundy in Nova Scotia, Canada was ruined by the Coast Guard and the residents of Burntcoat Head insisted that a new lighthouse was needed. In 1993, the plans were passed that a new lighthouse was going to be built and by the end of 1994, the replica of the Burntcoat Head Lighthouse was near completion. Today, visitors can visit the interpretative centre where information about the Fundy tides, old lighthouses and the history surrounding the area is available. Burntcoat Head Lighthouse (reconstructed), Highway 215, Fundy Shore Ecotour, Glooscap Trail, Minas Basin, Cobequid Bay, Nova Scotia, Canada. Site of the world's highest recorded tides. Picture of the reconstructed Burntcoat Head Lighthouse above the Minas Basin in the Bay of Fundy in Nova Scotia, Canada.